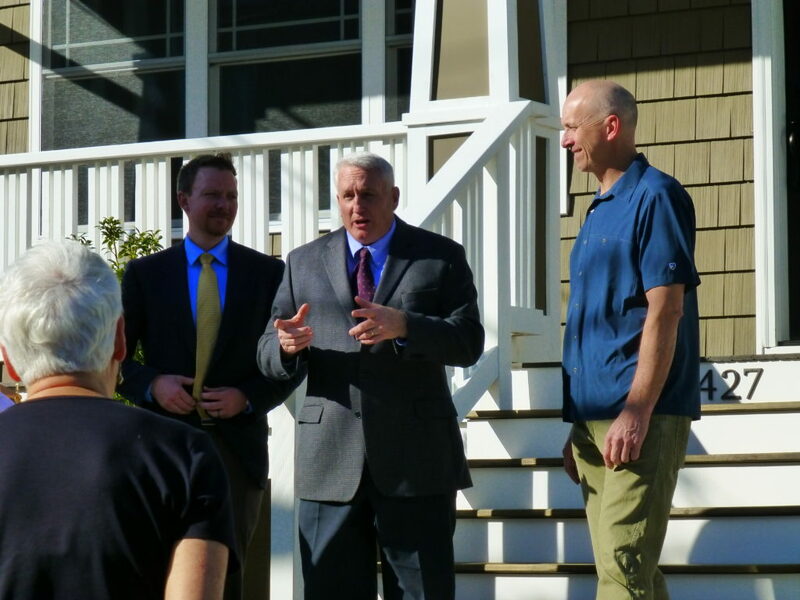 L to R: LakewoodAlive Executive Director Ian Andrews, Lakewood Mayor Michael Summers and Builder Dana Paul discuss the completion of the project. 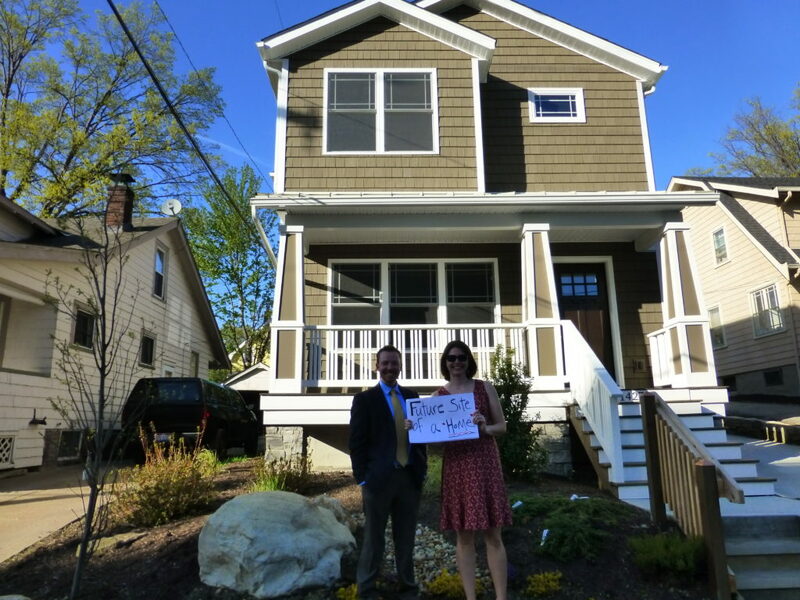 Builder Dana Paul was all smiles on this unseasonably-warm April evening as he unveiled the fruits of his tireless labor – a beautiful, new-build home at 1427 Scenic Street in Lakewood. Nearly one year to the day after ground broke on this project, LakewoodAlive hosted a Scenic Street Open House on April 27, inviting city leaders and community members to Lakewood’s Scenic Park neighborhood for an exclusive first look at the finished product. Paul, owner of Prairie Stone Group, the company responsible for the project, greeted friends and gave personal tours of the home marking the culmination of a long-held aspiration to give new life to a once-vacant lot. 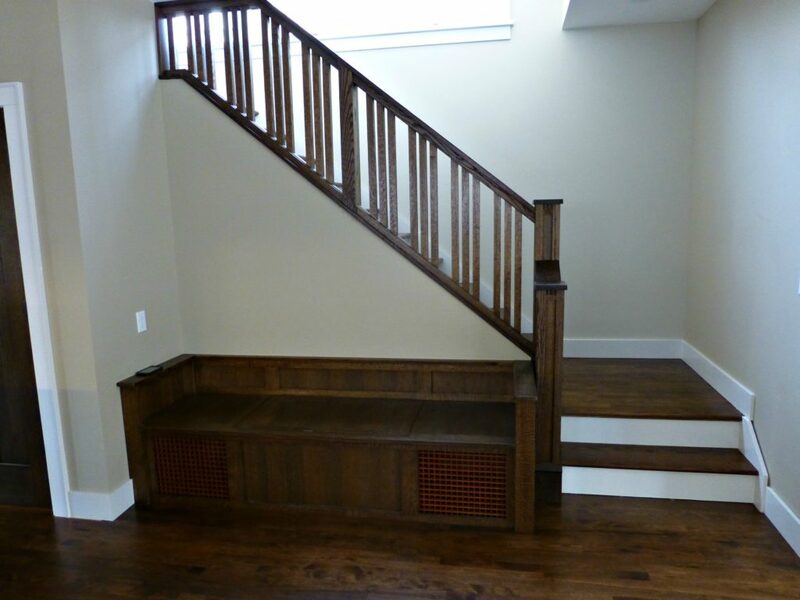 The 1,425 square foot home features three bedrooms, two-and-a-half bathrooms and a craftsman building style emphasizing handcrafted quality and keen attention to detail. Paul intends to list the home for sale in the coming weeks (visit his website for updates). The Open House festivities included tours, refreshments courtesy of Aladdin’s Eatery and a ribbon-cutting ceremony. Paul, Lakewood Mayor Michael Summers and LakewoodAlive Executive Director Ian Andrews addressed attendees from the property’s front steps. 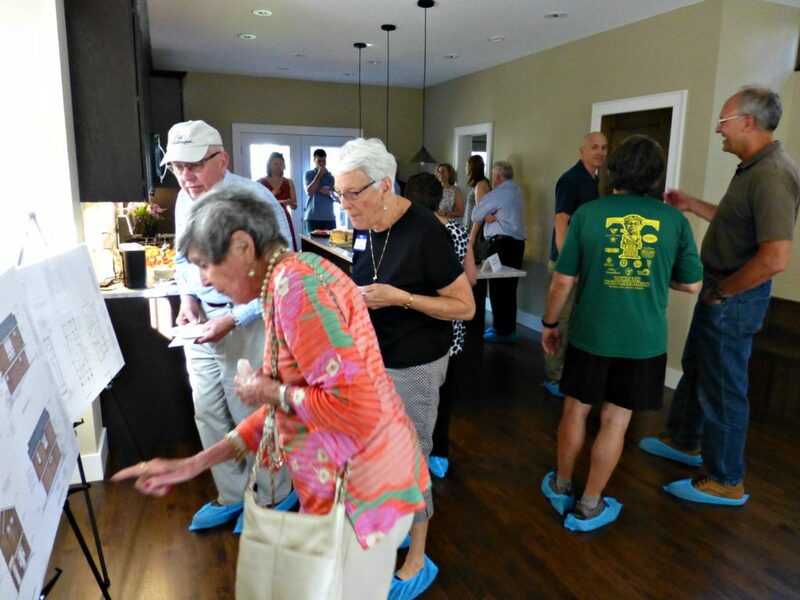 Open House attendees tour the new home at 1427 Scenic Street. With assistance from the City of Lakewood and the Cuyahoga Land Bank, LakewoodAlive had sought to convert this previously-vacant lot in western Lakewood into a new, single-family home. That transformation dream has now been realized. In 2015, LakewoodAlive began its Community Engagement Program with a goal of interacting with residents in the Birdtown and Scenic Park neighborhoods to connect them to resources ensuring they live in healthy and safe homes. The nonprofit organization began investigating the lot, which had been vacant and controlled by the Cuyahoga Land Bank for the past three years. LakewoodAlive’s Ian Andrews and Allison Urbanek pose with their sign from the original announcement in January 2016. LakewoodAlive worked with the City of Lakewood and the Land Bank to determine if a single-family home could be built on the property. Once the analysis confirmed this feasibility, a request for proposals was sent to dozens of developers. The property was transferred from the Land Bank to LakewoodAlive on January 6, 2016, setting this ambitious project in motion. Prairie Stone Group was chosen as the developer for the home and took title on March 1, 2016. Excavation commenced April 30, 2016, and LakewoodAlive hosted a Scenic Park House Project Launch Party on May 19, 2016. 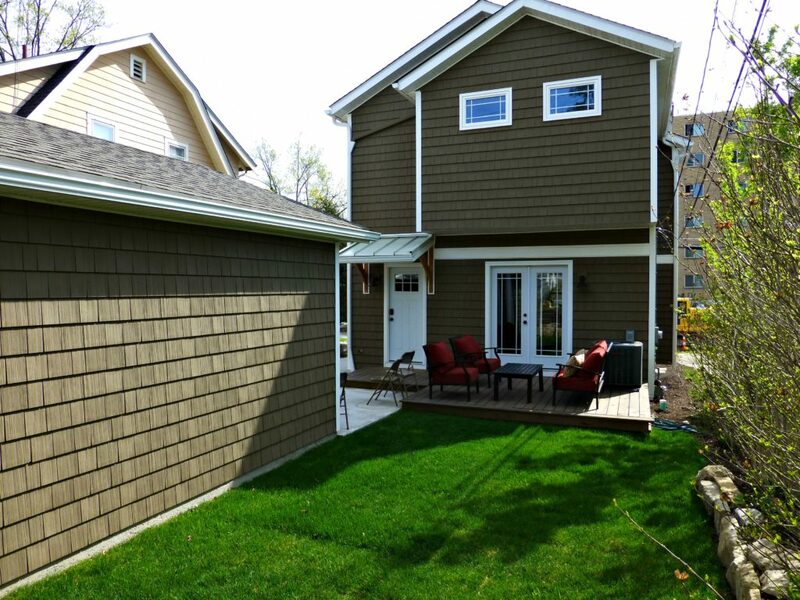 Since then, Paul’s tremendous efforts have resulted in the remarkable final product that now sits at 1427 Scenic Street.